unusualL! Prequilted fabric sold by 64" long. Beautiful! Prequilted, single sided fabric approximately 44" wide. There is a thin, see through fabric over the batting on the backside. 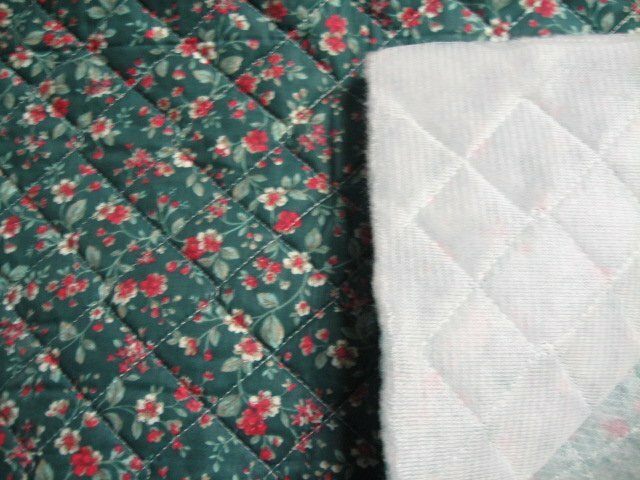 It is quilted through all three pieces. You may want to add a backing for a table runner, or you could use as is for a Christmas stocking for example. Pretty dark green floral fabric. Great for making placemats and table runners. Just cut, add a backing, and finish the edges with stitching or bias tape. PRE QUILTED- You don't need extra batting. Please view my fleece and flannel blankets for gift giving.